Located away from the main drag, you've got the final stretch of sand to yourself. The resort's tennis courts are a convenient place for players. Lounge on the pool deck and watch the river flow into the sea. All along the river you can go crabbing, fishing, or take a nature walk. You have premier beach access on the first stretch of beach. Avoid the cold and go for a swim in the indoor pool. Sands Beach Club Resort by Defender Resorts is located in Myrtle Beach, where the river meets the sea; you get to enjoy two amazing environments. You can fish on the banks or go crabbing and bring home the daily catch to prepare it fresh in your kitchen. Go for a peaceful nature walk or admire the beauty from a lounge chair on the pool deck. There are two pools: an outdoor pool and an indoor/outdoor pool along with hot tubs. When it’s time for lunch, fire up the bbq grills. Let the little ones help carry burgers, hot dogs and sides and get ready for a fun family cookout. If you’re into sports, there are lighted tennis, basketball and volleyball courts at the resort if you’re up for a friendly game. Take advantage of the access to a quiet stretch of beach, free from the crowded high rise hotels. Have the kids grab their buckets and shovels and get ready to watch them build the ultimate sandcastle. One- to two-bedroom condos sleep six guests. Full kitchens have everything you need to make and serve meals. Stop by Kroger to stock up on groceries. Let the kids get creative and make their own pizzas for dinner. Declare the pizza with the most unusual toppings the winner and the pizza artist official movie-chooser for family movie night. Condos include Flatscreen TVs with cable and DVD players. Once they’ve chosen from the selection of movies that you brought from home, call everyone into the living room and pop some popcorn. Show off your multitasking skills by doing a load of laundry in your in-suite washer/dryer while the movie is playing. Sands Beach Club Resort by Defender Resorts is next to Dunes Golf and Beach Club. It originally opened in 1949 and was renovated by Robert Trent Jones. Get ready to shop ’til you drop at Barefoot Landing and Broadway at the Beach. Both feature a variety of shopping and dining options. Barefoot Landing is home to Crabby Jack’s General Store where you will find souvenirs and gifts. Del Sol features apparel and accessories that change color in the sun. Best Gift Idea Ever has photos that resemble letters of the alphabet. Check out the Master’s Editions Fine Art Gallery; it has art from Thomas Kinkade, Abraham Hunter and Mark Keathley. Grab a snack at Auntie Anne’s Pretzels or the Beef Jerky Store. Broadway at the Beach has Reigning Cats & Dogs, where you will find unique gifts for your four-legged family member. Create your own unique piece of jewelry at Pick a Pearl. Kids will love Build-a-Bear where they can help make their own stuffed animal. 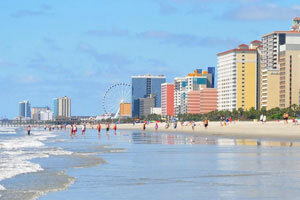 Go for a ride on the SkyWheel and enjoy the best views of Myrtle Beach. - There are two check-in desks located at Sand Beach Club. Guests booked at this resort should check-in at the Defender Resorts Timeshare Division office located in the lobby of South Tower of the property. The office is open 9:AM-5:00 PM Monday-Friday, 8:00 AM-8:PM on Saturday and 8:00 AM-5:00 PM on Sunday. Guests that are planning to arrive after hours can pick up keys to the unit from a lockbox located outside of the management office. For more details please contact the property using information on the booking confirmation. - Guests 18 to 20 years of age will be charged a security deposit which will be refunded, less damages, seven days after departure. The deposit must be paid to the hotel at least 48 hours prior to arrival.